Our benchtop-to-barnyard research program is #1 in the nation and leads MU in competitive grant activity. Read more. 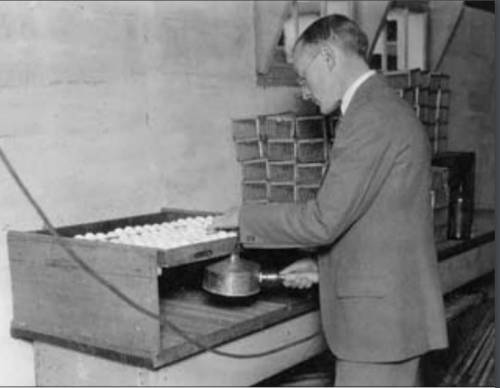 Prof. E.M. Funk candles hatching eggs in the 1920s to determine fertility. Founded in 1839, the University of Missouri is the oldest land-grant university west of the Mississippi River. In 1870, the College of Agriculture was established. The Division of Animal Sciences was created from the merger in 1989 of the college’s three departments: Dairy Husbandry (1901), Animal Husbandry (1904), and Poultry Husbandry (1911). Many of these research topics continue to be explored and studied today. For a more in-depth history of the Animal Sciences Division see: The Division of Animal Sciences, University of Missouri – 100 years, Agriculture Experiment Station Special Report 564, April 2006. Provide high quality intellectual experiences to educate students to understand and contribute successfully throughout their lives to a rapidly changing global and culturally diverse society. The success of these efforts will be evidenced by a continued strong demand for Animal Science graduates in the marketplace and by long-term success of Animal Science graduates in their chosen career. Increase the Division’s impact on animal agriculture in the future by attracting excellent students with an interest in animal agriculture and retaining them in our educational programs. Success in this effort will be documented by improved entrance exam scores and retention and graduation rates of our undergraduate and graduate students. Enhance strategic research strengths that will provide basic understanding and solve problems of animal agriculture and have potential applications to human medicine. Areas to be emphasized in the Division are: 1) reproductive biology; 2) efficiency of forage utilization by livestock; 3) nutritional modifications that enhance animal performance and global competitiveness of animal agriculture; and 4) genetics and genomics leading to improved genetic merit of livestock. Maintain ongoing communications with the various clientele groups of the Division to ensure that priority research and education issues are identified and addressed. We aspire to develop and disseminate new knowledge from research to enable off-campus extension faculty and the state’s citizens to be at the forefront of knowledge and technology. Evidence for success in these efforts will be documented by strong support of the Division, College and University from various commodity groups and industries involved in animal agriculture and improvement in productivity of animal agriculture in Missouri relative to that of competing states while making wise use of the state’s natural resources.